“That’s a spicy meat-a-ball” is a great line from the movie “Mask”. Well, okay it isn’t all that spicy – but it is a delicious recipe that I once again found on my favorite recipe site allrecipes. I followed the recipe almost exactly. I added more garlic than it called for, doubled the recipe and reduced the salt by half. Here is my doubled, adapted recipe. Enjoy. For the Meatballs: Combine the breadcrumbs, parsley, cheese, pepper, garlic powder and stir to combine. Add in the ground beef and eggs and combine (with clean hands works best). Form them into 24-36 meatballs depending on the size you want. After you formed them cover and refrigerate them until later. For the Sauce: Heat a large sauce pan and add the olive oil. Add the chopped onions and saute them until they are softened. Add the chopped garlic and cook for 2 more minutes until the garlic is fragrant. Add in the tomatoes, salt, and sugar and bring to a boil, then reduce heat and cook for at least 90 minutes. Use an immersion blender to blend the tomatoes if you don’t like it very chunky – ( An immersion blender it is a really good investment if you don’t have one – I use mine more than a blender plus I don’t have to remove the sauce from the pot and then pour it back. You can find them in most stores for around 30 dollars and up). After you blended it add the bay leaves, tomato paste, dried basil and pepper and stir to combine. Making sure the tomato paste dissolves into the sauce. Add in the meatballs and cook for 30 minutes longer. Take a meatball out and cut into it to see if it is still pink on the inside. If it is cook the sauce a little longer. Serve over your favorite pasta and sprinkle with shredded Parmesan cheese. 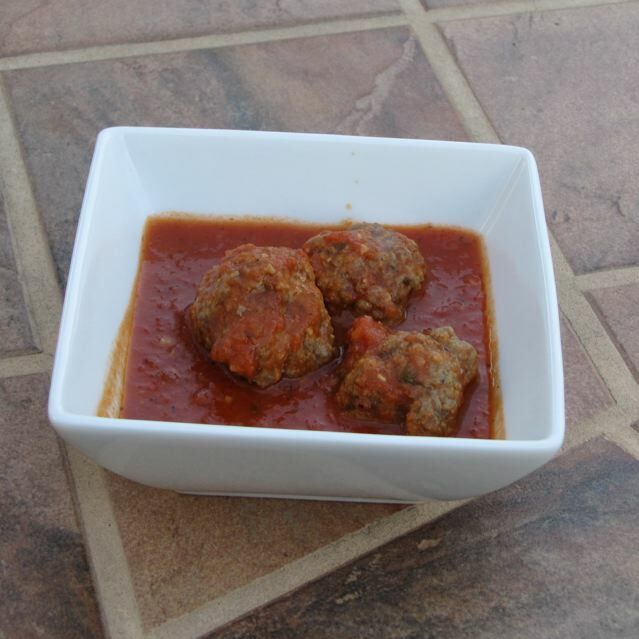 Categories: Main Dish - Beef, Main Dish - Pasta | Tags: Italian Spaghetti Sauce, Meatballs, Pasta Sauce, Spaghetti Sauce | Permalink. My Uncle Bill lives near the coast in Maryland and his wife Evelyn made these crab cakes for us on a recent trip to the East Coast. Yesterday I made them with canned crab meat. Though they were not as good as hers, because she used fresh crab, they were perfectly acceptable to eat. I added garlic to the onions at the end to give it more flavor. It was a nice addition. I think they would be really good with Cajun or Creole seasoning as well. Also I did not have a pepper in my pantry so I chopped up green onions and added them for color just before forming them. Saute onions and peppers in butter until softened. 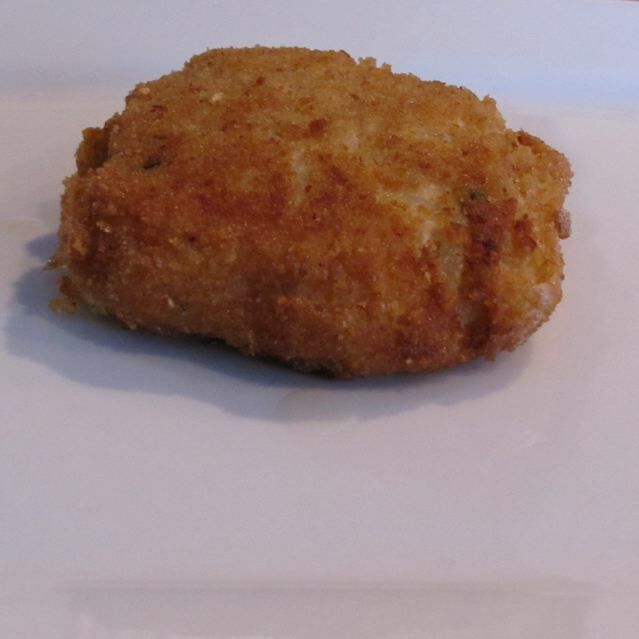 Categories: Main Dish - Seafood | Tags: Breaded Crab Cakes, Crab Cakes | Permalink. All three of my children enjoy eating salmon. I’m thankful my kids are not picky (or I never let them be picky- they ate it or they went hungry.) Here is a different recipe from the norm. 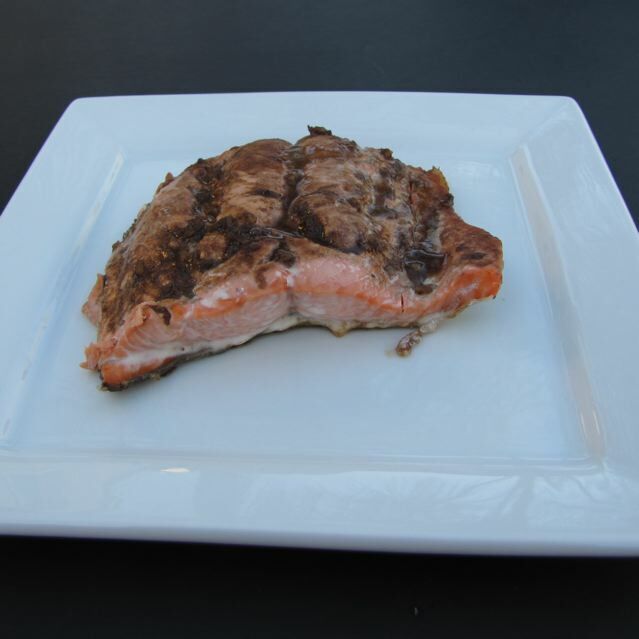 The salmon is brushed with a balsamic glaze and cooked in the oven. After it is cooked it is brushed with balsamic again. It has a lovely flavor. 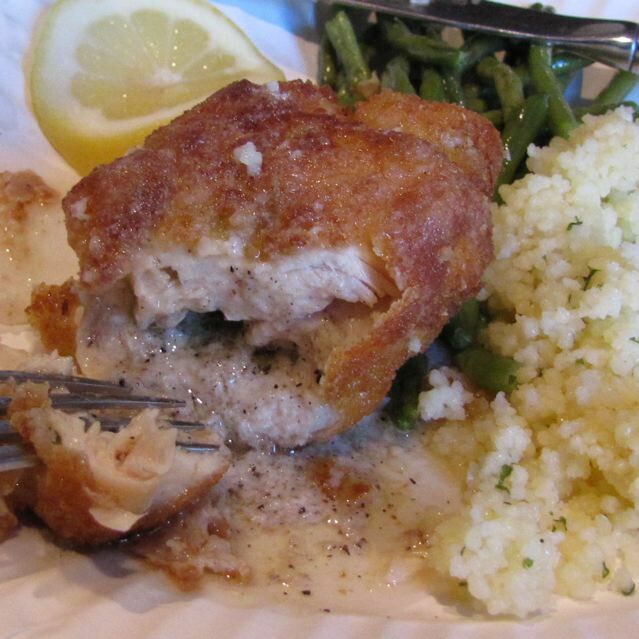 My kids still ate the fish with Tartar sauce, but my husband and I thought it was great with just the balsamic glaze. We will be making this again. I found the recipe at allrecipes. My only regret was that the salmon had a ton of pin bones. I tried to remove them before cooking but found myself shredding the fish, so I left most in and told everyone to be careful. I now know where I don’t want to get my salmon in the future. I would have loved to have had salmon steaks as it cooks more evenly. Preheat the oven to 400 F. Cover a sheet pan with foil and spray it with Pam cooking spray (or another brand). Over medium heat, cook and stir garlic in a small pan with a scant teaspoon of cooking oil until soft, about 3 minutes. Add the white wine, honey, balsamic vinegar, dash of soy sauce, mustard, and salt and pepper. Bring to a boil. Reduce heat and simmer, uncovered, for about 3 minutes, or until slightly thickened. I served this with steamed broccoli, couscous and fresh bread. Categories: Main Dish - Seafood | Tags: Balsamic Glazed salmon, Balsamic Salmon, Salmon | Permalink. 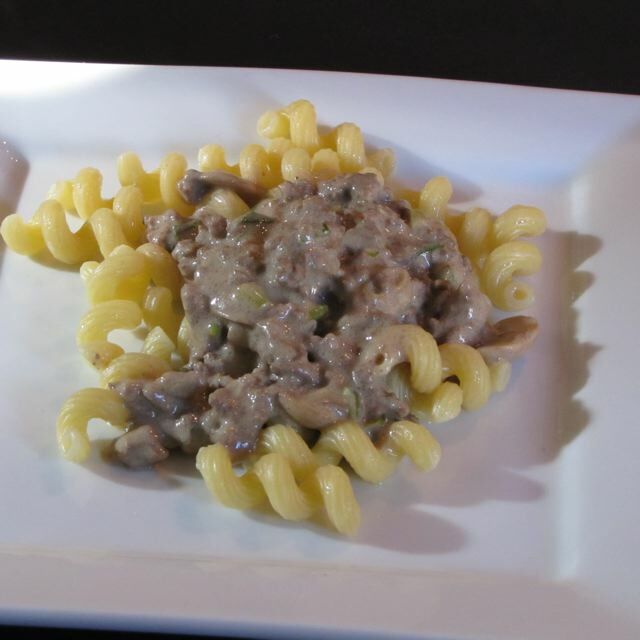 One of our stand by recipes is Beef Stroganoff. This is a recipe that comes together quickly and with ingredients that I usually have on hand. Today I made it slightly different from other times. I could not locate my recipe book so I tried to make it from memory and it turned out even better than usual. I think it is the garlic! It was so good that my family practically licked the pan I made the Stroganoff in. Serve over cooked pasta. Brown the ground beef in a large skillet until cooked through and no longer pink. Drain the fat. Add minced garlic and cook until aromatic. Add green onions and mushrooms and cook for about 10 minutes. Add beef gravy and sour cream and stir until combined. Heat through and serve over cooked pasta. Categories: Main Dish, Main Dish - Beef | Tags: Beef Recipe, Beef Stroganoff, Ground Beef | Permalink. On the theme of Asian food: After making the Asian Onion Soup we had these delightful Asian Lettuce wraps and a side of garlic steamed rice. 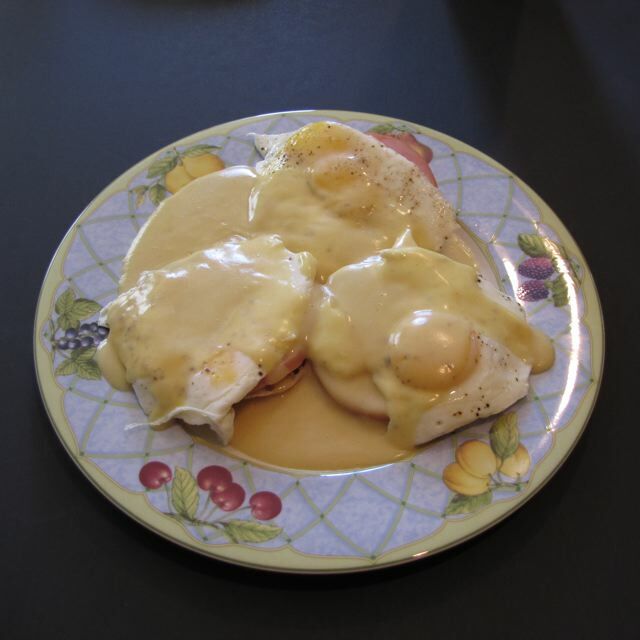 This is another recipe that I discovered on allrecipes.com. It was easy to eat. I also made a dipping sauce that reviewers said worked nicely. It added extra spice for the adults (and my 6 year old son who likes spicy foods)– don’t worry it is not overpowering. Another change I made was that I added grated carrot to the meat mixture. It added extra color and flavor to the dish. You could easily substitute pork or ground turkey for the ground beef. You might be scratching your head at some of the ingredients wondering where to get them. The answer lies with Target! 🙂 They have Asian ingredients like Sesame oil, pickled ginger etc. 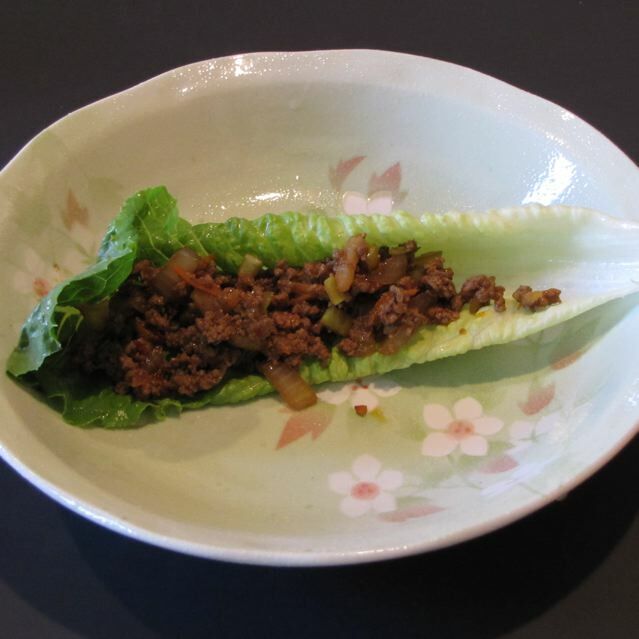 To serve: Place large lettuce leaves on your plate and spoon some of the meat filling into the lettuce leaves. Wrap and enjoy. Notes: This is a quick and easy dish that is ready in minutes once you have your ingredients assembled. For the garlic rice: bring 2 cups of chicken broth to a boil. Add garlic flakes to the broth. Add 1 cup Jasmine rice. Cover and reduce heat to low. Cook for 15 minutes. Turn heat off and leave covered another 15 minutes. Serve with Asian Lettuce Wraps. Categories: Ethnic - Asian, Main Dish - Beef | Tags: Asian Lettuce Wraps | Permalink.